DO-70001-70 was succesfully added to your cart. 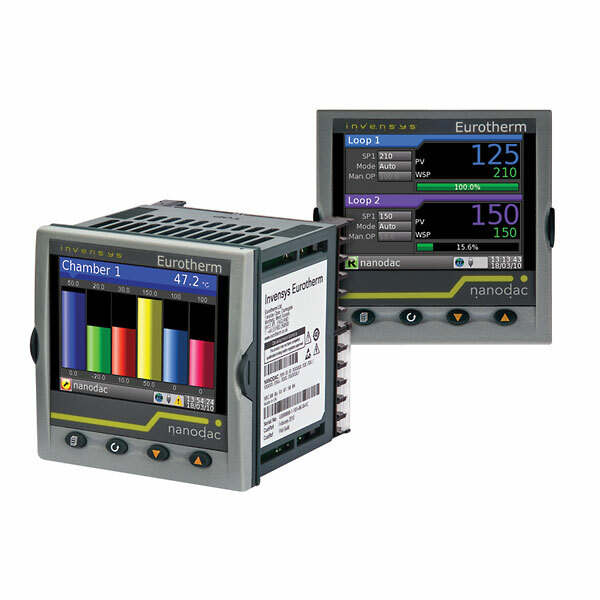 The nanodac paperless recorder features secure data recording, graphical display, and optional PID control — all in a compact 1/4 DIN panel-mount design. Full-color 3.5” TFT provides a crystal-clear operator interface for monitoring and process control. Choose to view your process information with horizontal and vertical trends, bar graphs or numeric values, and easily display the alarm status and control loops. Four front-panel push buttons allow simple scrolling between configured views. Each nanodac contains 50 MB of nonvolatile Flash memory for data storage. All process data is continually logged to this memory and the recorder offers multiple archive strategies to ensure that your data is never lost. You can automatically archive data to a database, to a removable USB memory stick, or over the Ethernet via FTP site. Recorder functionality is supported by PC-based tools to get data in the way you need it. iTools software creates a secure library for data from which charts can be reviewed, printed and exported to other PC packages as required. All data is encrypted in binary files (UHH format) and can be configured to run over the network which allows for a third data backup route. Choose models with two independent PIC control loops for reliable control of your process. Functionality includes one of the best autotune facilities available along with overshoot inhibition (cutbacks); compensation for power fluctuations using power feedforward; and linear, fan, oil, and water cooling. Configuration is also done using the downloadable iTools software; any configuration created for a nanodac recorder/controller can be stored, modified offline, and cloned for use in other Eurotherm instruments, saving you time and money. The optional carbon zirconia block, normally used with control loops, is used for percentage carbon control in furnace atmospheres; the nanodac can also be used as a carbon monitor. Name files by Cycle No.